This cat picture was taken in Ravello, Italy, and previously published in the photo essay book CATS OF ITALY / GATTI d'ITALIA by Janet Wellington. "In 2012, I was invited to attend the Women’s Fiction Festival in Matera, Italy, to speak on a panel about indie publishing—along with two other indie authors," says author Janet Wellington. 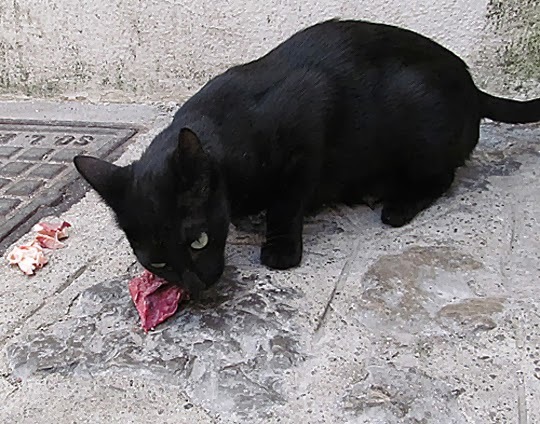 "In the weeks before my trip, as I was researching fun things to do and see in Italy, I began seeing references to the many feral cats in the country. I was traveling with my BAF (best author friend) and we planned to spend our last four days in Rome before coming home...so, when I discovered the Torre Argentina Roman Cat Sanctuary, a no-kill shelter in Rome for homeless cats, I knew had to visit! Before arriving in Rome, though, I began seeing cats…everywhere…and I always kept my camera ready to take a photograph. I suppose that’s when the idea of the book CATS OF ITALY really started germinating. Cats found me first on the Amalfi Coast—in Ravello and Positano. Later, cats found me in Matera, on the Island of Ischia, and finally in Rome and at the Cat Sanctuary of Rome, also known as Torre Argentina." Lovely kitty from the lovely Ravello. Have a tremendous Thursday. How beautifully black and sleek this kitty is! That beautiful kitty is enjoying a good tuck in! I think that is a great idea for a book! What a black beauty, a young male by the looks of it. That's one good-lookin' cat! STUNNING. good evening two ewe cats oh Italy frum all de kittehz oh trout towne ! well, of course i would love black. its one of my fave colors. beautiful! cheers!! What a beautiful black kitty! Looks like he or she has some yummy chunks of meat there. 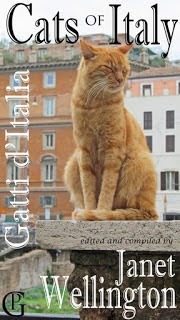 I'm sure cat lovers will really like your book, Cats of Italy! I love how they have a cat sanctuary! Il est content, celui là, il a trouvé un bon morceau ! I am so happy they have a shelter! He is beautiful!